It may not be spring, but we’re totally faking it in this house. 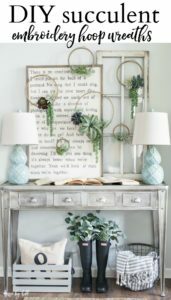 I’m completely down with pretending it’s spring, and I’m beginning the spring decorating with these super-cool DIY Succulent Embroidery Hoop Wreaths! Hoop wreaths are a very popular alternative to traditional wreaths these days. They have a more streamline look and are so much fun to hang anywhere in your house. This is my first embroidery hoop wreath project, and there were so many directions I could go. I settled on a succulents because I felt like they would give me a fresh, spring feel without being too flowery. For whatever reason, (maybe it’s because we were just shoveling snow) I’m not quite into “flower” mode yet. I love spring flowers though, and I’m sure I’ll get there. I gathered my supplies, (all from Hobby Lobby). I also ended up using floral wire, so pretend there is some floral wire in the supply shot above. To give the hoop a more finished look, I stained them with some “Driftwood” wood stain. After I began, a fellow-blogger and sweet friend of mine (Seeking Lavender Lane) suggested using dark finishing wax instead of stain because it dries so much faster. SO smart!